Out painting the town on a Saturday night, and I immediately spy, a brilliant blue swimming pool with a glass runway! Whatt? How is this possible? Three steps into the YSL bash held for NYFW, and I’m already in awe. 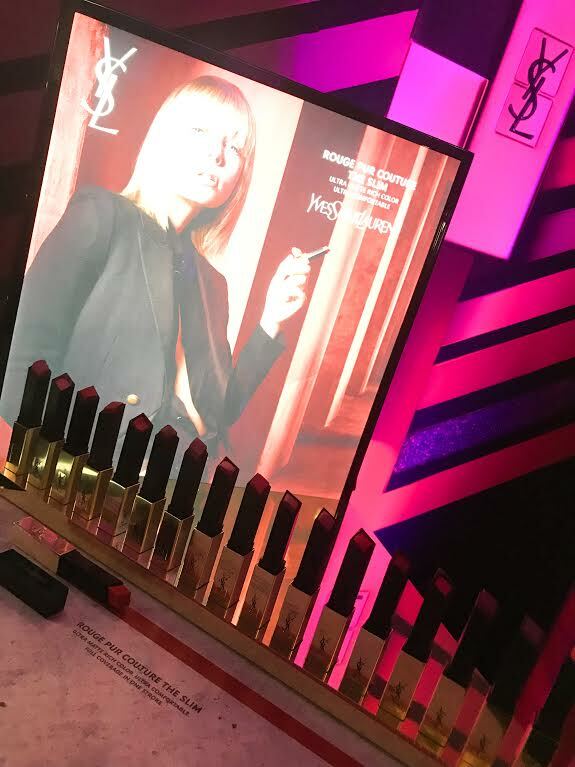 The event was hosted at the YSL Beauty Hotel, by Harper Bazaar’s Beauty Director, Jessica Matlin, photographer of the September Issue, Kenneth Willardt, and makeup by YSL Beauté Global Beauty Director, Tom Pecheux. We kicked off the evening, literally walking on water, while strutting down a glass runway. Fearful to fall in? YES! Did we do it anyways? Most definitely, and it was divine! 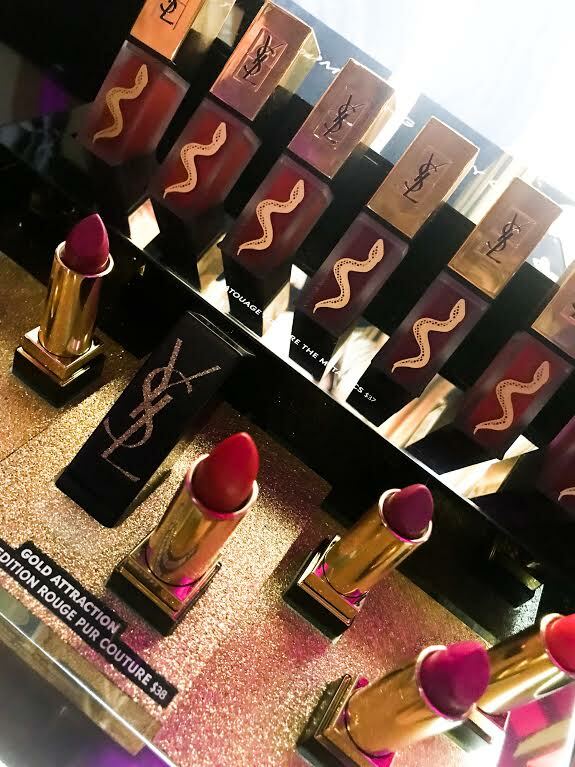 YSL is celebrating the launch of their Fall 2019 collection and I’m beyond excited. YSL has always been my favorite beauty brand. I adore their lip colors and the stains are fabulous. I wear them daily. Beware…you’ll still have that brilliant color on the next morning, if you don’t remove it. I love that the color is long lasting, taking me from day to evening, leaving me feeling fancy for hours. I also wear the Yves Saint Laurent Mon Paris fragrance daily, as well as YSL Black Opium. As we walked up flights of stairs, we discovered multiple levels of interactive excitement. From a photo booth with air guitars, to a dreamy rooftop, complete with cocktails, my blogger bestie, Haili and I were in heaven. We tried several different lip stains which lasted us through the dance party, as well as margaritas and dinner at La Esquina (one of my favorites). For the soirée, I felt I needed to dress the part, so of course that meant sequins! 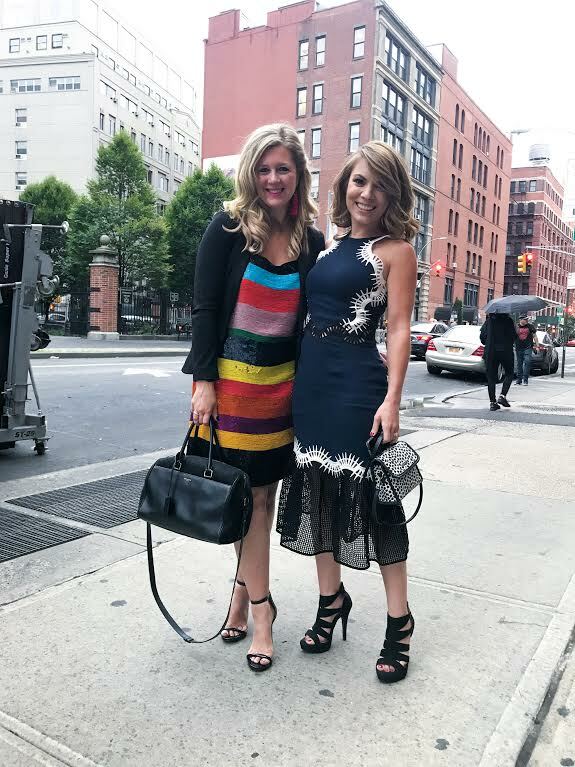 I stumbled upon a multi color, striped sequin dress from one of my favorite brands, Alice and Olivia, and it had me at hello. I layered this beauty with a black blazer, and open toed sandals. To accessorize, I wore crystallized burgundy tassel earrings from my fall collection, and carried a round, crossbody bag from Furla. Hey there, Sass-a-frass! As the weather is cooling off, don’t you feel that your style should sizzle? Let’s chat about that, shall we? There are so many different ways to spice up your look for fall. The crowded city streets, of New York Fashion Week are quite the site to say the least. Dull? Never. Your head will spin with an array of colors, patterns, and textures worn by each and every fashionista that stomps your way, so you better slide your sunnies on and work. One look is more extravagant than the next, and after awhile, it all seems like a circus on display. I love to play along, don’t get me wrong, and there’s nothing more inspiring that the runways come to life. Hi. My name is Hallie. I’m 5’2″ on my good days. My feet dangle when I sit on chairs, subway seats, and toilet seats (I know…tmi). I choose food at the grocery store, based on the shelves I can reach…which isn’t many. When it comes to clothing, it’s a greater challenge. April showers finally brought May flowers, as promised. While I wish I had a lovely garden in my backyard, or even just a backyard for that matter, I don’t. Living in NYC means highrises and apartment living, so I borrow Central Park, and call it my own backyard from time to time. It does feel that way, for as much time as we spend there. This past weekend was no different. The sun is shining, and the tulips are in full bloom. People are out and about, and I absolutely love it. Is there anything better? 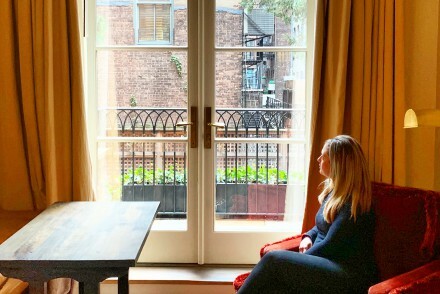 The holiday weekend in NYC felt nothing short of fabulous.There’s just something about this time of year that makes me feel much more alive. Get it? Got it? Good! I’m talking about some school girl sass. You know that buttoned up, crisp, clean look? The look resembles a uniform, but when paired together correctly, you can create a killer style that’s oh-so-chic. How many sequined and beaded dresses do you stash into your closet after the holidays? How many fancy dresses do you purchase for weddings, and toss to the side, just one hot second after the event is over? I get it. I’ve been there. It makes sense, right? When will you ever wear a sequined or beaded dress on a typical day, or evening out? Queen of Hearts seemed to be my theme for the weekend. The reasons you ask? There are two, so I’ll share. This weekend was frigid in NYC. I would have loved nothing more than to stay curled up in my pjs, but we somehow managed to pack the weekend of projects and activities. Being a couch potato is basically kryptonite for me. I go stir crazy, get cranky, and it basically spirals out of control, until Grant is ready to launch me out of the window (#truth). This past weekend was TOASTY in NYC…just the way I like it. Speaking of hot, let’s add a bit of edge to your summer wardrobe, shall we? Lovely! I’m so glad you agree.